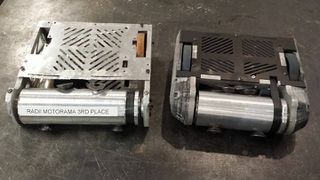 Difference between revisions of "3lb Beginner's Guide"
The purpose of this guide is to educate the reader on some key factors relating to the 3lb weight class of BattleBots. While originally intended for members of the RoboJackets team, this guide contains information that is relevant to anyone trying to get into BattleBots! This weapon is a spinning ring with teeth that surround the entire frame. Generally, the ring is supported by "rollers" which have bearings to reduce friction and support the ring with a male-female interface. The ring is typically driven directly by the weapon motor which has a casing of a high friction material such as rubber. Additionally, there is a variant of the Ring Spinner called the Shell Spinner. The Shell Spinner is nearly identical to the Ring Spinner, except instead of a "ring" that is spun around, the entire robot is covered in a shell which is spun. This allows for even more weapon coverage, at the cost of more weight being required for the larger shell, as well as the need for a stronger motor to spin it. 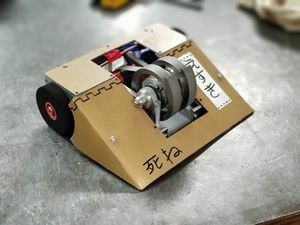 Members of the RoboJackets Battlebot team do not build Wedge's as it is often more rewarding to build a more complicated bot, regardless if it performs as well as a wedge would. By building a non-wedge bot, the team's engineering skills tested much more and ultimately the members will grow more as a result. The following is a detailed explanation of the design process for the RoboJackets BattleBots team. While this is specific to our team, it can be used as a general guide for anyone who wants to improve their design process. Being successful in competitions starts with the design process. While everyone wants to immediately jump into machining and get their bot done, without a proper design process the end result will be ineffective and probably nonfunctional. Additionally, without a proper CAD assembly with accompanying dimensions machining will not result in usable parts. So while it might not be as exciting as machining and assembling, it will be worth the wait in the end. Along the way, examples from the design process of Senpai will be included to demonstrate the steps as they are described. The design process begins unofficially with brainstorming. Once you have an idea about what type of bot you want to build, research notable examples of that type of bot! Look for examples with differing types of weapons, armor, and drive systems. Try to find some videos of these bots actually competing! See what works and what doesn't. Once you've seen enough, start piecing together your ideas into complete concepts. Do a rough sketch of the shape of the chassis, weapon, etc. If there are some unique features on your concept, write out some notes so that when you or your team revisit it, it will be more easy to understand. Don't limit yourself to just one idea either, the more ideas you bring to your team during the first few meetings when you decide on an overall design, the better. It is worth mentioning that you will be on a team, so don't get TOO attached to one idea, as not one person on the team will end up having designed the entire bot. On the right, you can see an example of what good brainstorm sketches look like. There are many ideas drawn out, with a variety of features demonstrated between them. Things to focus your brainstorming on would include weapon type, weapon shape, drive system, overall shape, and armor. It's important to note that no idea is a bad idea during the brainstorming phase. Any and all ideas are beneficial. While a given idea may not work, when you gather with your team you may find that a teammate will have an idea that could take a not so good design and make it great. Additionally, you may find that your team will go back to these brainstorming ideas for inspiration to solve issues with the design way down the line. In other words, the more ideas you come up with and put down on paper, the better! As you can see they lack any sort of dimensions or details. However, they are still enough to serve as an idea for what a robot could look like. This is very important to have as a starting point for the remainder of the design process. This is when the design process will start properly. Once you're on a team the first goal is to come up with a bot design. Think broad. Focus on features. Odds are that the design you end up with by the end of the sketch face will not be what the robot you end up building will look like. As you go through the rest of the design process, you will make changes to this design. However, this doesn't mean that it's not worthwhile to come up with some rudimentary overall dimensions, such as the overall length, width, and height of the bot. These dimensions can be based loosely off of previous bots as a guideline. The top sketch is a good example of what should be drawn at the start of the sketching step. As a team, you will produce several of these sketches, each time adding more details as you discuss the design. As you can see this top view shows the approximate location of the frame, wheels, motors, and weapon. Details such as fasteners and electronics are not yet included, as this sketch would be developed before those are considered. It is important to work out details in a logical order. Start with a sketch similar to those in the brainstorming phase. Work out how the structure would work. Next, add in things like the weapon and armor. 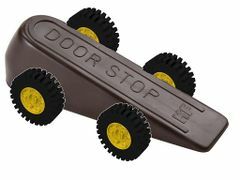 Then, add in the motors, wheels, and belts. Finally, add the fine details like wires, electronics, and fasteners. This process will allow you to logically work through taking a concept in your mind and putting it onto paper. As more and more details are flushed out, the sketches will become more and more complex. Eventually, your team should have a detailed final sketch, such as the bottom example. As you can see, most if not all components are included. Multiple views are included as well which will significantly help will visualization of the final design. Its noteworthy to see that while the sketch is incredibly detailed (and no you don't need to be an artist, most final sketches won't look this good), it still wouldn't be enough to jump directly into CAD. That's why we have the next step! Once you've got an overall sketch of the bot, its time to start drawing some individual parts out and assign them some dimensions. This is important, as having some predetermined dimensions will make the CAD process easier. Make sure that your team is communicating during this process, as its important that everyone understands the dimensions so that any given member could make the CAD part for any given part. The more your team understands the dimensions you define, the faster and more efficient the CAD process will be. Additionally, drawings should be made that give me explicit details in areas of the bot that have complex assemblies and sections of the bot. Having these draw out ahead of time will expedite the process of translating the drawing into a CAD assembly. During this time, you will also have to determine what material the parts are made out of. As part of this, you need to start considering minimizing size and weight, while still allowing enough space internally for batteries, wires, motors, receivers, and ESCs. Additionally, keep in mind the purpose of the part. A weapon needs to be something strong like steel or aluminium, while non-structural internal walls can be made of weaker materials like plastic. Another thing to consider during this time, is how you will attach the parts into a complete assembly. Consider using a puzzle-fit, the number of screws used to connect two parts, location of holes, and size and type of screws. Beware intersections of screws, and dont have so many screws that your part is completely filled with holes, or "Swiss cheesed". This step can be done simultaneously with Step 4, as you draw and dimension parts as you need them during the early meetings. However, it's important not to put off finishing the drawings for all parts, as it can make it harder to work outside of meetings. There should always be a group present when dimensioning parts, so if you don't have any parts that are dimensioned, you can't make a good CAD part. Proper CADing is a team effort, not a solo effort. When you work alone, you risk misinterpreting a dimension or drawing. During meetings, one or two people should be actively working on the CAD with the remaining members talking through the process with them. Communication is key! By working together on the parts, you will end up creating quality uniform parts. Taking turns working on parts is also important, to ensure everyone gets time working with Inventor. It is entirely expected that your team will need to work on the CAD outside of official meetings, but this work should be only on the parts for which the team has already decided on dimensions for. Meeting with other team members outside of the official meetings is also a good idea for ensuring your team is progressing fast enough to meet your deadlines. When making parts, try to assign dimensions in a way that makes it easy and go back and adjust the dimensions easily. If your dimensions are assigned all over the place and are liable to conflict, it will take much longer to adjust these values which will inevitably need to happen. Worst case scenario, you may need to completely remake a part due to the original being made improperly. You will be provided with some default parts, such as a battery, drive motors, receiver, drive ESC, and some standard fasteners. 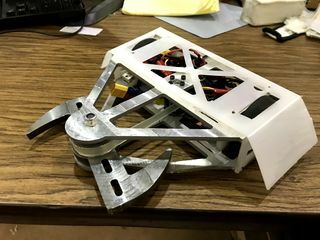 It is important to assign materials to the parts that you make, as this will allow you to track the overall weight of the bot. You may find that you have only made half of the parts you need, and the overall weight is already to high. With this information, you can go ahead and adjust the dimensions of the parts you've already made to reduce the weight. Remember that the parts will need to be manufactured from stock, so once you have determined a way to manufacture a part, check how much the stock you'd need will cost and how much material will be wasted as part of your manufacturing. For example if you have a part that you know how you could manufacture, but it would require a $100 chunk of aluminum, most of which is removed in the process, maybe look at redesigning the part to be simpler so it can be manufactured with cheaper stock. Additionally, this step also will give you the clearest image of what the parts true shape will be. With this, you must ask yourself a very important question... how will you actually manufacture this part? It is very easy to create a part that is the perfect shape to fit in the assembly, but cannot actually be created! 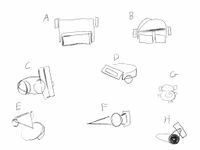 For each part, it is worthwhile to consider what approach you'd take to manufacture the part, and what tools you'd need. Finally, you don't have to finish all your parts before moving onto the next step and creating the assembly. Prioritizing creating the structural elements and putting those into an assembly before finishing the more minor parts will allow you to sooner check that the current plan for the robot makes sense and that the parts are correctly sized. It is worth knowing that you will be provided with some default parts, such as a battery, drive motors, receiver, drive ESC, and some standard fasteners. Once you've gotten enough parts done, it'll be time to start assembling the parts into an overall assembly. This is when you'll first be able to determine how your bot design would work in reality. This will be what you'll need to have completed for the design review. There are several factors to consider with the assembly, with the obvious factor is the weight of the bot. It's important to have an assembly that is not only below 3 lbs but is safely below 3 lbs. This is because the assembly doesn't take into account the wires and connectors, which are quite heavy. Additionally, imperfections in the materials you use and the parts you make out of them will not match the parts perfectly, and can often be heavier than it's digital representation. The assembly will also be where you will need to add in the fine details, such as screws. Its also a good time to ensure that your team has included clearances on your parts to account for the imperfections related to the machining process, especially those related to the water-jet. While creating your assembly, it is often a good idea to create sub-assemblies, as it allows the team to work on different sections of the overall assembly at the same time. Common sub-assemblies are a weapon assembly and left/right drive assemblies. It is not necessary to create these sub-assemblies, however, the ability to allow multiple people work on subset of the overall assembly is very important to overall productivity. During this time, it is also important to begin working on a Bill of Materials, or BOM for short. This BOM will be a master list of the materials required to create the robot, and where they can be purchased. Keeping an accurate and through BOM will allow you to launch directly into manufacturing as fast as possible after the design is complete. It's important to take notes during the design review, as even a "good" design review will result in enough changes that you'll need to write them all down. Once you get out of a design review, it's important to strike fast while the iron is hot. After your first design review, there will more than likely be several huge changes that you'll need to make to both your individual parts and the assembly as a whole. There is NOT a lot of time between the first and second design reviews, due to the natural time constraints of the 3 lb program. So it's important to start working on these changes sooner rather than later. It's important to also make sure you address ALL the things that are mentioned during the review, as it's important not the waste everyone's time with repeat issues from the previous review. Now final you can begin manufacturing! Thanks to the design process, the quality of the parts you manufacture and the quality of the robot as a whole will be greatly increased. This doesn't mean everything will go as planned however. Inevitably, something will go wrong during the manufacturing process, or even when assembling the robot. You will need to make minor adjustments to the design as you manufacture, and when you do so make sure to update your CAD to reflect these changes. Beware changing too much and causing the overall assembly to be overweight. Below is a step for step guide on the calculations required to determine what motor to chose for your bot. Keep in mind these calculations are fairly simplistic and don't take several real-world factors into account. Additionally, these values will be computed based off of what is reported by the manufacturers, which are often "best case scenario" and are not what you should expect to see in practice. That said, these calculations will give you the information that you will need to make an educated decision on if a motor will work as you desire. Several values are required that we must calculate before getting the values we actually desire. For the calculations past this point, please use the output values in place of our old input values.